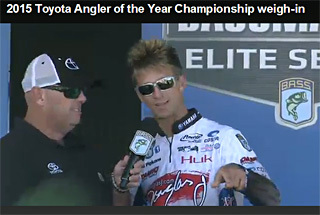 Elite Angler Chad Pipkens talks with Bassmaster emcee Dave Mercer on stage during day 2 of the Toyota Bassmaster AOY Championship tournament. Pip is in 3rd place and 29th place in AOY points! Probably punching his 2nd consecutive Bassmaster Classic invitation, Elite Angler Chad Pipkens moved up to 29th place in Toyota Bassmaster AOY points with 5 Sturgeon Bay bass weighing 16-3! Pipkens is sitting in 3rd place at the Sturgeon Bay Toyota Bassmaster Angler of the Year Championship with a 2-day total of 34 pounds 4 ounces, 5 pounds behind the leader Greg Hackney. Noteworthy for today, fellow Elite Angler Brandon Card publicly thanked Pip on stage for helping him get on his catch today of 13-13. Card had a zero yesterday which means zero AOY points. Pipkens told Brandon exactly what he was doing and where he was doing it. Brandon went there after asking Pip if it was really okay on the water (Pipkens was on Bassmaster LIVE today), and caught a 5-pounder along with his respectable limit putting him back in contention for a Classic berth!